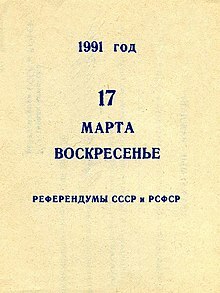 The Ukrainian sovereignty referendum was conducted on March 17, 1991, as part of the first and only Soviet Union referendum. Throughout the Ukrainian Soviet Socialist Republic, voters were asked two questions, with an additional question attached to the ballot in the historical region of Galicia which includes the Ukrainian provinces of Ivano-Frankivsk, Lviv, and Ternopil. The referendum followed the Declaration of State Sovereignty of Ukraine by the republic's parliament on July 16, 1990. In December 1991, Ukraine held its independence referendum, where 92.3 percent of the voters approved the August 24 declaration of independence. Do you consider necessary the preservation of the Union of Soviet Socialist Republics as a renewed federation of equal sovereign republics in which the rights and freedom of an individual of any nationality will be fully guaranteed? Do you agree that Ukraine should be part of a Union of Soviet Sovereign States on the basis on the Declaration of State Sovereignty of Ukraine? Would you like Ukraine became an independent state, which can independently decide all questions of domestic and foreign policy, providing equal rights to citizens regardless of nationality and religious views? This page was last edited on 21 February 2019, at 11:29 (UTC).